Marcel Belliveau holds a special place in my heart. He was not only a hero, he was a fighter who overcame obstacles on the ice surface as a member of the vaunted Montreal Canadiens of 1914-15. In the fall of 2009 he was honored by the Montreal Canadiens when his name was included on the plaque in the Molson Center, home of the Canadiens, in Montreal, of the players who played for the greatest sports organization in the past 100 years. However, my grandfather was was more than an Acadian hero, he was a patriot who fought for his country and paid the price for our freedoms. I dedicate this story to all veterans and the bravery and valor they gave in defense of our values. Thanks, Grampy! Marcel Belliveau was a strapping young man of nineteen when he ventured into the Canadian Army recruiting offices in Moncton in the summer of 1915. 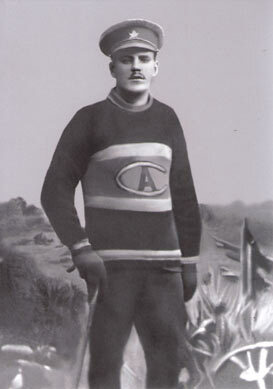 Born in Moncton in 1895, Belliveau had just completed his rookie season with the Montreal Canadiens Hockey Team, the first Acadian to perform in the major leagues of the growing professional sport. In his youth, Belliveau and his family chose to buck the animosity that existed between the English and Acadians in Moncton and entered St. Bernard’s, an all English Catholic boys school on Botsford Street. When hockey season rolled around, Belliveau, who had not yet mastered the English language, was placed in goal where it was thought he could do the least harm. Indignant over the assignment, he promptly displayed his prowess and went on to score six goals from his goaltender’s position, in his first game. That was the last time he played the position and went on to lead the St. Bernard’s school to the New Brunswick High School Hockey Championships a year or two later, prior to departing for Montreal. In the summer of 1915, World War I was underway and like so many brave young men Marcel wanted to defend his country and signed on with the 5thCanadian Mounted Rifles and headed for England. After receiving an initial payment of .89, Marcel took up arms and headed to Europe to defend the Crown and the Dominion of Canada. At the Battle of the Somme, Belliveau was struck in the chest by a German machine gun bullet. The “dumb-dumb” bullet pierced the pay book in his shirt pocket, altering its direction enough so that it narrowly missed his heart but shattered his left lung before logging in his chest cavity. Like other fallen soldiers that day, he was collected and thrown into a mass grave. Left for dead, atop the heap of extinguished humanity, he laid exposed, face-up, to members of his departing regiment. A friend stopped a moment to pay his “final” respects only to be startled by the sight of Marcel’s eyes opening and closing. Retrieved from the grave, Marcel was rushed to a field hospital for treatment before being shipped back to England and an army hospital near Hazelmere, in the County of Surrey. His English bride, Ruth, whom he married in January 1916, was a resident of Hazelmere. She had just given birth to their first child, Ruth. The process of saving Marcel was begun and within a six month period, veterans hospital doctors did all they could to save his life. Caring for and nursing Marcel back to health became a fulltime responsibility for the hospital workers and his dedicated young bride. After months of convalescence, Marcel was shipped back to Canada on a hospital ship and was committed to another military hospital in St. John for additional treatment and care. His new bride followed soon after, leaving their daughter with the grandparents in England. Ruth assumed the arduous daily task of caring for his wound, a responsibility she accepted and performed, with loving devotion, the rest of Marcel’s life. The years that followed were a ritual of care, more surgeries and rehabilitation. At the age of twenty-five, six years after the bullet entered his chest, the pieces of disintegrated bullet casing had corroded to the point where they began rupturing his pulmonary artery. Fortunately, Belliveau had been admitted to the River Glade sanitarium for a severe case of phenomena when he sustained a massive hemorrhage, the first of many that almost claimed his life. Doctors worked tirelessly to pack the wound and when all else failed they administered a horse serum that was used to stop bleeding in the equines. 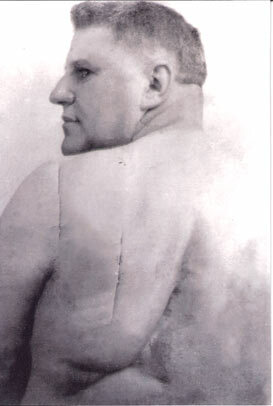 Belliveau survived that six month period before being moved to the Royal Victoria Hospital in Montreal. In Montreal his doctors gave him no hope of survival but agreed to experiment on him as a last resort. Dr. Archibald, a thorax surgeon, was instrumental in performing one of the first lung extraction surgeries in Canada. 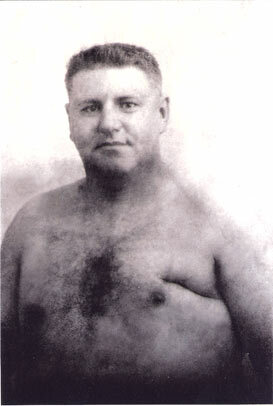 Belliveau endured fourteen surgeries under a local anesthetic as Archibald removed bits and pieces of the left lung over a six month period. Entering the chest cavity from the back required that a gaping hole be created in Belliveau so that doctor’s had the freedom of access to retrieve the disintegrating lung as needed. Belliveau survived, but not before doctors warned the family that operation twelve would probably be fatal. It was not to be! Belliveau survived. Accepting his condition Belliveau returned to Dorchester where he was employed as a guard at the Federal Penitentiary. Unfortunately, his disability would not allow him to perform the strenuous duties of managing inmates and he retired within a year. Pain was constant. Codeine was the only medication that could contain the coughing which accompanied the healing process and the accompanying hemorrhaging. Belliveau ultimately became addicted to the drug, a dependency he lived with for nine years. At the age of twenty, his daughter Evangeline contracted tuberculosis and was confined to bed in their home. However, her father’s drug dependency was affecting her will to live. She confided in him that if he did not treat his dependency she would leave and did not care about the consequences. Without hesitation, Belliveau boarded a train and entered the detox unit at the Veterans hospital in St. John. Six weeks later, Marcel returned home, seventy-five pounds lighter, emaciated and near death himself from the “drying-out” process. Never again were drugs an issue. His pain was controlled by his will to live and to meet the needs of his family. Following his time in the service, years of treatment and a 100% disability, Belliveau returned to his beloved hockey as coach of the Dorchester High School Hockey Team in 1927 and 28 where he guided them to two provincial championships. In 1941, at the request of Warden Goad, Belliveau was asked to rejoin to the penitentiary staff, in a less strenuous capacity, and retired from active duty in 1959. Marcel Belliveau’s legacy is one that transcends the norm. As a child growing up in his home and as a young man residing with him throughout the summer months, I never once heard him complain or show signs of discomfort when his open wounds were routinely bathed in alcohol and iodine. Nor did I ever hear him seek sympathy for his disability or the surgeries he had to confront. He was a father to four children and grandfather to six. Thanks to Marcel’s will to live that day at the Somme, sixteen of his progeny owe their lives to this remarkable man. Belliveau was a generous man who brought his family up to follow his lead. As a child growing up, it was a common occurrence to see discharged inmates arrive at the door of our home seeking a meal and some money for their trip to a “new life.” I never saw him turn anyone away, and I always remember how he dipped into his pocket turning over what monies were there to the freed man. I can still hear him say to the departing inmate, “I do not want you back here. You are too good a man with too much talent to break the law again. Do you hear me?” The discharged inmate would always make a solemn vow to stay on the straight and narrow. Sometimes he did and sometimes he returned. Regardless, Marcel was neither his judge nor jury, only his friend, in or out of incarceration. Marcel Belliveau is a hero. He is a man who gave away his dreams to keep the rest of his country free from the Tierney of the “Bosh”. He served with distinction, honored his country, his Acadian heritage and his family by being the greatest man I’ve ever known. The sixteen of us, children, grandchildren, great-grandchildren and great-great grandchildren are thankful for his sacrifice and we are committed to honoring his memory and his example as we go through life. The spirit of Marcel Belliveau lives! On behalf of my mother, uncle, aunts, children, grandchildren and cousins, I respectfully appreciate the honor you are willing to bestow upon this great man by including him in your tribute to New Brunswick’s fighting men. Thank-you Bob for sharing your family's history..Its an awesome tribute. As a child growing up in Dorcheste I had the privelige of knowing Marcel Belliveu and his son and daughters, however I was not priveliged to know all the greatness of this man. We were all aware of his having played with the Montreal Canadians and his war record and injury but that was bare bone information and your article was so rewarding for me. Dad worked with Mr. Belliveau at the Federal Institution in Dorchester and allways spoke highly of him as he also was a veyern of World War #1. Thank you for the story that completes my information of the man. very interesting story Never knew this even though I lived next door to the Belliveau\'s all my life till 1959 when I left Dorchester . Bob I believe you and I were friends (we were about 6 0r 8 yrs. old at that time) when you use to spend your summers in Dorchester with your grandparents Thanks for the story. I keep in touch with Judy and Ozzie via Christmas card about the only people I do so now , old friends from my home town . All my family are gone now ,both parents and sister. Enjoyed reading your reflections on your grandfather. It gave me some ideas to expand upon with my family genealogy work. Nice work, Robert. Boy do you look like him! J.